The return to D&D got off with a good start with no problems at all with respect to coding or events throughout the session. We played for about two hours, and the heroes made good progress into the next stage of the adventure. 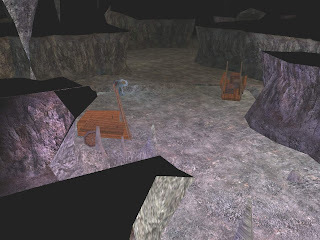 My only concern was that we could not hear many of the sounds in the game, as two of the computers I currently use have very noisy fans and they drowned out some of the more useful sounds, like rockfall noises and static for the blue crystal encountered. Overall though, these were minor problems and the game went well. Indeed, the heroes have made such good progress, that they are likely to get to the next area at the next meeting. I was able to "save" the game and reload without affecting any data, which means I have reduced the chance of database errors. This test did show one variable was out (the player's online count), but I was able to fix this with one Quick Fix Patch to the hak on the server only, which I have found does fix the game for all players who join. As we move closer to the new style of playing (using NWN2 within the new era upon Althéa), I will begin to worry less about details used in the earlier style of playing. An example of this is the exact timing of the events played. From now on, I will give dates for the adventure only, rather than to the hour. "The heroes passed into the caves beyond. Immediately it was obvious that they had now entered the once lucrative mines of the Garad-Loons dwarves, as mine carts lay scattered around the caves that were once used to transport ore and equipment. There was the odd useful item like rope, but anything of real worth had been taken already. "